On Monday morning, July 11, 2005 at 9 a.m., Jeff 's parents Marilyn and Bob Wear were notified at their front door that Jeff had been fatally injured in a traffic accident. Jeff, age 27 was their oldest son. He has a younger brother Matt, who lives in Los Angeles, California. The tragedy was very unexpected and hit the whole family very hard. 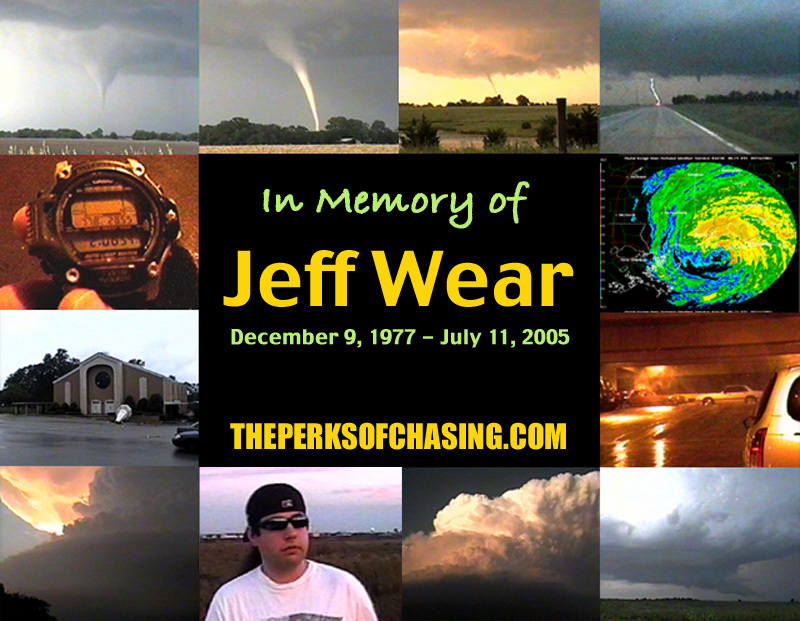 It is widely known throughout the stormchasing community how important the weather was to Jeff. He had devoted his life to weather and that is why he moved to Norman, OK.
Jeff was returning from chasing Hurricane Dennis the weekend of July 9-11, 2005, when he encountered sudden heavy rains on I-20 near Kilgore, Texas. Although he was driving at or below speed limit, the sudden downpour of water on the highway caused his car to hydroplane off the road, across the meridian and into oncoming traffic on the other side, where he was struck by a flatbed truck and killed instantly. Jeff's family has decided that Jeff would have wanted to keep his work in storm chasing available for the pleasure of all that were interested, and as such his website will remain intact. His videos are still available through his mother Marilyn Wear as well directly through this website. We have made every effort to keep his website as close to the way he last left it as possible. We have linked a few pages he had completed but not yet linked to the main site. The payment links for video have been adjusted to go to his mother, and the email addresses have been changed as necessary. Otherwise, it's just like he left it. You can read just how his fellow storm chasers felt about Jeff in this message board thread at StormTrack.org. Videos - Quicktime movie clips of tornadoes, lightning, and time lapse of supercells. NEW!!!! Images - Scanned 35mm prints and video captures of thunderstorm-related phenomena dating to 1994. Merchandise - DVD and VHS highlights from Jeff's chases. Links - Weather information, weather-related businesses, other chasers and severe weather enthusiasts. The Vault - Chase humor, editorials, climate summaries, interesting weather events, and everything else that doesn't quite fit in the other categories. Looking for paintings of flowers, birds, or the Sierra Nevada landscape? Visit my mom's site Marilyn's Painting Studio.